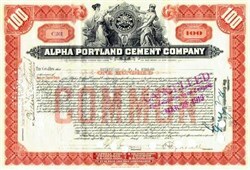 Beautifully engraved Certificate from the Alpha Portland Cement Company issued in 1925. This historic document was printed by the American Banknote Company and has an ornate border around it with a vignette of two allegorical women standing beside a seal of the company. This item is hand signed by the company's officers and is over 84 years old. The company changed its name to Alpha Portland Industries in 1972. Portland cement is a fine powder, gray or white in color, that consists of a mixture of hydraulic cement materials comprising primarily calcium silicates, aluminates and aluminoferrites. More than 30 raw materials are known to be used in the manufacture of portland cement, and these materials can be divided into four distinct categories: calcareous, siliceous, argillaceous, and ferrifrous. These materials are chemically combined through pyroprocessing and subjected to subsequent mechanical processing operations to form gray and white portland cement. Gray portland cement is used for structural applications and is the more common type of cement produced. White portland cement has lower iron and manganese contents than gray portland cement and is used primarily for decorative purposes. Portland cement manufacturing plants are part of hydraulic cement manufacturing, which also includes natural, masonry, and pozzolanic cement. Portland cement accounts for 95 percent of the hydraulic cement production in the United States. The balance of domestic cement production is primarily masonry cement. Both of these materials are produced in portland cement manufacturing plants. The initial production step in portland cement manufacturing is raw materials acquisition. Calcium, the element of highest concentration in portland cement, is obtained from a variety of calcareous raw materials, including limestone, chalk, marl, sea shells, aragonite, and an impure limestone known as "natural cement rock". Typically, these raw materials are obtained from open-face quarries, but underground mines or dredging operations are also used. Raw materials vary from facility to facility. Some quarries produce relatively pure limestone that requires the use of additional raw materials to provide the correct chemical blend in the raw mix. In other quarries, all or part of the noncalcarious constituents are found naturally in the limestone. Occasionally, pockets of pyrite, which can significantly increase emissions of sulfur dioxide (SO2), are found in deposits of limestone, clays, and shales used as raw materials for portland cement. Because a large fraction (approximately one third) of the mass of this primary material is lost as carbon dioxide (CO2) in the kiln, portland cement plants are located close to a calcareous raw material source whenever possible. Other elements included in the raw mix are silicon, aluminum, and iron. These materials are obtained from ores and minerals such as sand, shale, clay, and iron ore. Again, these materials are most commonly from open-pit quarries or mines, but they may be dredged or excavated from underwater deposits. Either gypsum or natural anhydrite, both of which are forms of calcium sulfate, is introduced to the process during the finish grinding operations. History from the EPA Website.